Want some nutty treats for the holidays? I have two – these spicy honey roasted pecans which are quite hot, and some smokey almonds which I’ll post next. Both are very addictive and will, I’m sure, disappear before your eyes. In fact, I had wanted a photo of these pecans in a cute little serving dish next to the olives and hummous but alas, Andrew ate them all before I could get them from stove to counter to table. Good thing the recipe calls for more (much more) spice mix than you need – I still have a bag of it so it will only take me a sec to whip up another batch! Whisk together all spice mix ingredients in a medium-size bowl until thoroughly blended. Store in an airtight jar. This recipe makes 2 cups (500 mL) of spice mix, enough for about 10 batches of Spicy Honey Roasted Nuts. To make spiced nuts, preheat oven to 350°F (180°C). In a large mixing bowl, stir together oil and honey and then add Spice Mix. Blend well, add pecans, and toss until nuts are well coated. 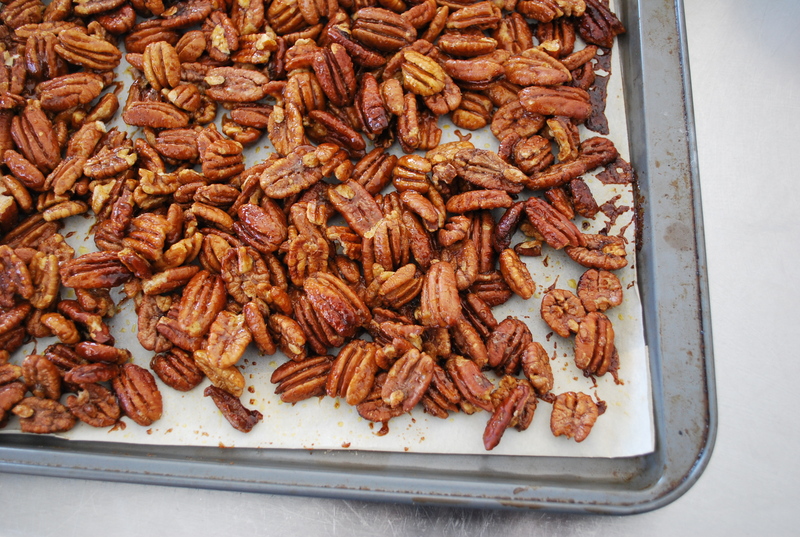 Spread pecans evenly on a greased baking tray and bake 10 minutes until nuts are golden. Allow to cool and serve at room temperature. Nuts will stay fresh for two or three days when refrigerated. Serves 12.